Curtis has many talented and creative friends. Stephen Zimmer, historian and long-time friend, has written many articles about Curtis for magazines and other publications. Each month we will have a new article or story by Steve...some fact...some fiction...but all about the West. Danny Stevens and Curtis attended school together in Tatum and have remained close friends. Danny has been photographing Curtis and his art for many years. Each month we will have different examples of Danny’s photos of the West on our website. Please visit often. Contact information for both Steve and Danny is listed below. Steve Zimmer was raised on his family’s ranch north of Amarillo. He received a B.S. in Anthropology and a Master’s Degree in History at UNM. After college he directed the museums at the Philmont Scout Ranch for twenty years. 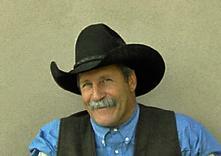 He authors books about the west and writes for many publications, such as Persimmon Hill and Western Horseman. Steve is currently working on a history of the open range days in 19th Century New Mexico. Now retired from Philmont, Steve teaches a few history classes and is involved in many ongoing writing projects. Steve resides with his wife, Shari, and sons, Parker and Marshall, at their ranch outside Cimarron, New Mexico, where they raise Quarter Horses. Danny is an accomplished photographer who has a passion for the western way of life he sees every day on the New Mexico Caprock. Danny, owner and operator of Southwest Valve and Pump in Tatum, NM, has developed a deep knowledge and love of the land on which he works on a daily basis. He has been a professional photographer for over 25 years and always has his camera ready to capture his subjects. Stevens’ photos of cattle, horses, landscapes and wildlife show true understanding of the beauty of his subject matter. One of Danny’s favorite subjects is the American Cowboy and through his photos he has captured the essence of a cowboy’s life on the Llano Estacado.